It's not easy shining a spotlight on someone like Lee Bennett Hopkins. It's like pointing a flashlight at the sun. Many of you who are reading this know exactly what I'm talking about. For those who don't, let me introduce you to this talented and generous soul. 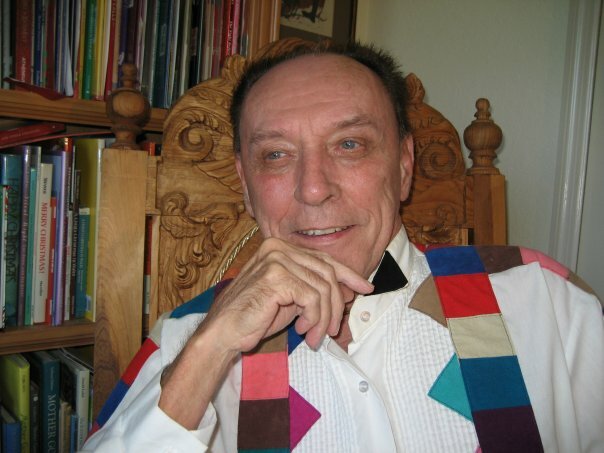 The Lee Bennett Hopkins Poetry Award– presented annually to an American poet or anthologist for the most outstanding new book of children's poetry published in the previous calendar year. 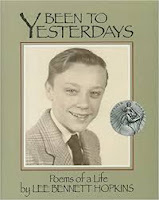 The Lee Bennett Hopkins/IRA Promising Poet Award– presented every three years to a promising new poet of children’s poetry. 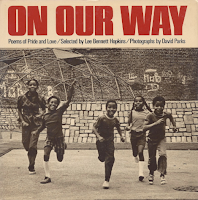 The SCBWI Lee Bennett Hopkins Poetry Award– presented every three years to recognize and encourage the publication of an excellent book of poetry or anthology for children and/or young adults. From humble and disadvantaged beginnings, Lee's hard work and determination has served him well throughout his life and career, carrying him to his preeminent standing today– a beloved national treasure. I'm thrilled and honored to be featuring Lee this month, and his newest, wonder-filled anthology, JUMPING OFF LIBRARY SHELVES. September means back to school, of course, but did you know it's also Library Card Sign-up Month? Just think how many girls and boys are beginning life-long love affairs with books thanks to this piece of plastic small enough to fit in your pocket. And what better way to celebrate the significance of libraries than with this gorgeous collection? Not only is this a warm welcome (love those "spoons of sun"), but as a reader, I feel assured of an extraordinary experience. Everything about this anthology IS extraordinary, from the star-studded poet line-up (including Nikki Grimes, X.J. Kennedy, J. Patrick Lewis, Alice Schertle, and Jane Yolen, among others) to the imagination and soft, dreamy quality of Jane Manning's exquisite gouache and pencil illustrations. JUMPING OFF LIBRARY SHELVES captures the joy of reading. It thrills in the excitement of walking through library doors– "the sweet kingdom of story" as Nikki Grimes describes it, the enchanting lure of stacks upon stacks of books, and the superpowers of owning a library card. 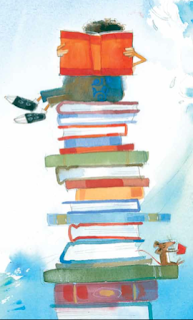 It celebrates the generous spirit of librarians, the "quiet weight of words" per Deborah Ruddell, and helps us to feel warm, snuggly, and peaceful with our favorite books... like this one. Just one reading was enough for me to give it "one-of-my-all-time-favorites" status. I wouldn't be surprised if you have the same response. Lee Bennett Hopkins has outdone himself again. I hope you'll enjoy learning a little more about Lee, starting with five favorites. Favorite vacation spot: Aboard a cruise ship in a luxurious suite. As a child growing up in less than ideal circumstances, your focus was on survival rather than reading. And yet, at the age of twelve, you knew you wanted to be a writer. You hadn’t been exposed to children’s poetry at that point, so what kind of writer did you envision yourself becoming? I truly never envisioned becoming a writer. The only thing I wanted to do was to become a teacher. And I did. Writing came by accident; a lovely accident. How did your childhood shape you as a future poet and teacher? From the time I was in the 8th grade I wanted to become someone like my 8th-grade teacher, Ethel Kite McLaughlin at South 8th Street School in Newark, NJ, a woman who saw something in me I did not know existed. She changed my being, teaching me there was more to life than living within a confused, dysfunctional family, to reach out, explore, learn – become independent. Become myself. I pay tribute to her in a poem appearing in my book, BEEN TO YESTERDAYS: POEMS OF A LIFE (Wordsong/Boyds Mills Press). I knew the only way out of a life living in Newark-projects was to somehow get an education. I worked hard and long to complete college. If there was just one piece of advice you could impart to educators about the importance of introducing poetry in the classroom, what would it be? Just read it. Find those poets and poems you love. JUST read it. READ it and think and dream and learn from it. Although you no longer teach on a regular basis, you continue to champion children’s poetry at every opportunity. Besides the three poetry awards you’ve founded, you consider it your personal responsibility to mentor newer poets and promote their work in your anthologies. What drives you to do that? Back to my childhood years: I had a wondrous maternal grandmother, Lena Thomas, a working-class woman who believed in giving back– giving back to make a difference in lives. As for mentoring new voices? Why not? It is my small way to give back…to discover fresh talent, to help people find a way to share their work. When I find that rare individual I’ll bend backwards to help them along. I am known to be a tough critic. Several I’ve tried to work with give up. I am very opinionated, not always the best trait, but after a life immersed in poetry and knowing the best of poets writing for children personally, I have a sense of what is great and what is merely mediocre. I have brought a host of new voices to the poetic world. People whose work has soared. The amount of research, time, and effort that goes into compiling and producing one of your anthologies is astounding. In your 2013 interview with Renée LaTulippe, you explained that you might read several thousand poems to determine which ones to use. Add to that the time it takes to commission, edit, obtain permissions, illustrate, and publish these works, and we’re talking YEARS to fruition. What gives you the biggest joy in putting together a new anthology, despite its many challenges? I love doing anthologies. I guess I should, having done close to 120 of them for every age level. Working on a collection is like doing a giant jigsaw puzzle. Again, I am able to include new voices along with established poets’ works. A great joy for me is when I can use a verse by Carl Sandburg, Langston Hughes, et. al., followed by a poem by someone never published before. What joy this brings me. It is thrilling. And, yes, it does indeed take years from concept to holding a bound book in your hand. 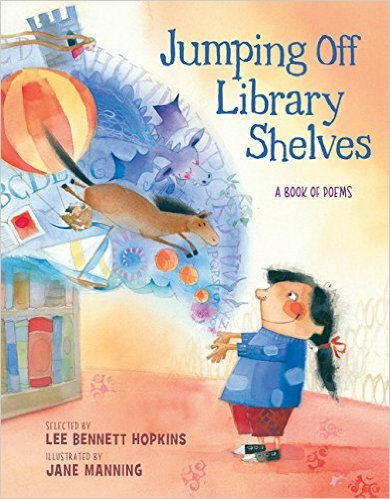 JUMPING OFF LIBRARY SHELVES includes a wonderful poem you penned yourself called “Storyteller.” You dedicate it to Augusta Baker, a librarian and storyteller renowned for her contributions to children’s literature. Would you tell us a little more about your connection with her? Was she the one who inspired this anthology as a whole? Augusta was a dear friend of mine who I met while working at Bank Street College of Education in Harlem, NY, in the late l960’s. She was a librarian, storyteller and the first African American woman to hold an administrative position with the New York Public Library. She did not inspire JUMPING… but while working on the collection I knew I had to pay tribute to her. Just knew it! 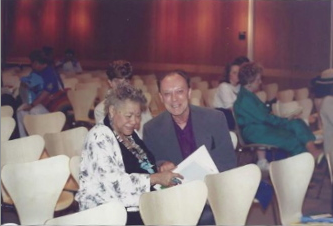 Whenever we were together, whether dining at the famed Algonquin Hotel in New York City or having a bowl of soup in her home in Columbia, SC, I FORCED her – to read Langston Hughes’ “Mother to Son” to me. No one read it like she did. I still get goose bumps ‘hearing’ her in my mind, in my heart. I was privileged to have her write the Introduction to a collection I did in l974, ON OUR WAY: POEMS OF PRIDE AND LOVE (Knopf), a book of poems extolling African American youth. 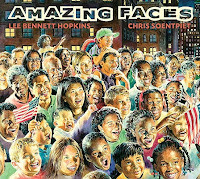 The book was illustrated with photography by David Parks, Gordon Parks, the famed photographer’s son. 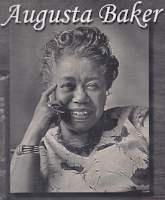 Beginning in 1987, an A(ugusta) Baker’s Dozen conference is held each year at the Richland County Public Library in Columbia, SC where Augusta lived after retirement. I had the privilege of being the colloquium speaker at the 7th annual conference with Anita Lobel. Another good friend of hers, Maurice Sendak, did the art for the conference logo. She knew everyone! How wondrous it was she was in my life and will be ‘happily ever after’! The poem “Storyteller” in JUMPING… flowed from me…to her. What favorite book (or books) might we find under your pillow? I do not have a book under my pillow but I do have a host of them in my dreams. 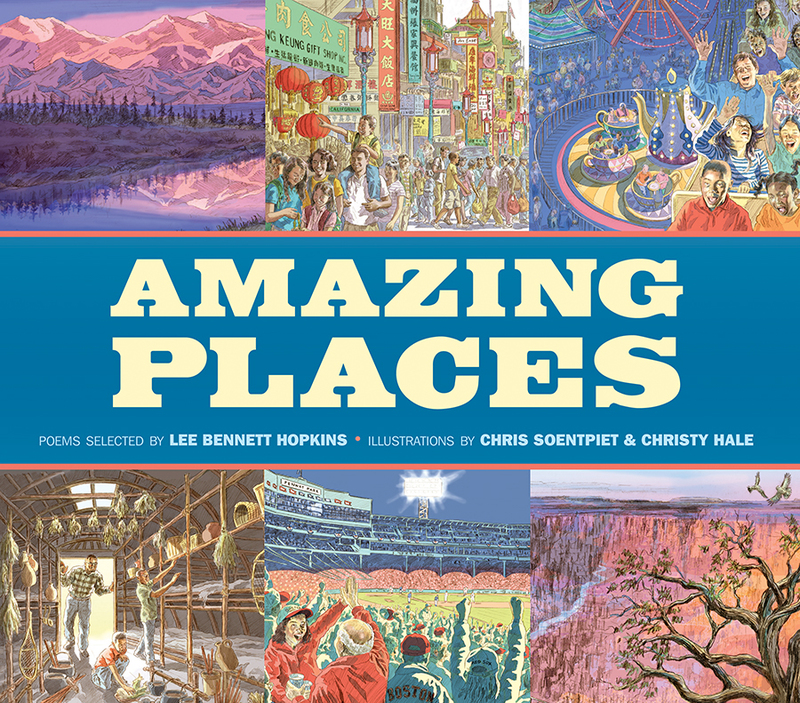 AMAZING PLACES, a companion book to AMAZING FACES (both Lee and Low) has also recently been launched. The book contains new poems written by Nikki Grimes, Rebecca Kai Dotlich, Linda Sue Park, and Kristine O’Connell George. The collection highlights famous sites such as Niagara Falls, the Liberty Bell, but also includes little-known wonders such as a longhouse at the Oneida Nation Museum located near Green Bay, WI. A very different anthology to appear in the future…too soon to discuss…is one I am working on with my brilliant editor and dear friend, Rebecca M. Davis at Wordsong/Boyds Mills Press. Rebecca and I have done countless books together over the years. There is only one child like you in this world. Thank you for listening. Onto tomorrows! for sharing yourself with us today and for the love you've poured into children's poetry each and every day for the last several decades! Lee has also graciously offered an autographed copy of JUMPING OFF LIBRARY SHELVES to one lucky participant! A random drawing will be held at the end of the month. Throughout the month, send your ME poem to TodaysLittleDitty (at) gmail (dot) com or use the contact form in the sidebar to the right. TEACHERS AND PARENTS: It's a new school year, and I would love students to get involved. Ditty of the Month Club challenges are wonderful opportunities to learn about working children's poets and authors while having fun with poetry prompts, like this month's ME poem. For children under 13 who would like to participate, please read my COPPA compliance statement located below the contact form. Some poems may be published on the blog as daily ditties, but all of them will appear in a wrap-up celebration on Friday, September 25, 2015. Last month's dragon-inspired couplet challenge, brought to us by Penny Parker Klostermann, was a huge success and resulted in a whopper of a cumulative poem. Many thanks to Penny and to all those who participated and/or cheered us on. ROSI HOLLINBECK – Congratulations, Rosi! Linda Baie is always up for a challenge. Today she is gathering all the Poetry Friday goodness at TeacherDance. It's always a pleasure to share your work, Amy. We all need an Ethel Kite McLaughlin, don't we? Appreciations Michelle, for bringing the gusto of LBH to Today's Little Ditty in this nourishing interview. I ached with some of his poems in BEEN TO YESTERDAYS. And then I soared with the poem "What" about his beloved Miss Ethel, who should become a patron saint of children's poetry. Will try my hand at the challenge - can't resist the eyedear of those educated eyes perhaps connecting with at least one line in it - wow. The process to produce the anthologies - 1,000 read to pick one perfect poem - speaks to his boundless respect for children. This is one of my favorite articles here at TLD - more thanks. JUMPING has been at the top of my booklist since this summer - love seeing the selected poems & lucious artwork. Happy new school season to you, too. "His boundless respect for children." <– You're so right, Jan. That says it all. Thanks so much for your comment today, and happy new school year to you too! Marvelous interview, Michelle! I will be sure to link to it when I do Lee's SPOTLIGHT video post later this month! Lee is a gem, and all his facets shine in this post. I'll be sure to join in with a ME poem this month. Grazie!!! What a wonderful, inspiring post, Michelle! I admire Lee so much and it was incredibly exciting to read your Spotlight this morning. Thank you both! I loved Amy's poem as well. I will definitely have to get a copy of this new anthology! I know you'll love it, Becky. Glad to get your Friday off to a good start! MICHELLE I cannot thank you enough for the time and effort you put into this blog. Frankly, I am overwhelmed. I am also b l u s h i n g ! You brought back a lot of wondrous memories for me with this piece. Brava! Nothing looks better with purple than a bit of pink in the cheeks, Lee. ;) Seriously though, I was delighted to do it! It's a wonderful and exciting start to your month's challenge, Michelle. 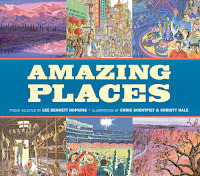 Showing off Lee's wonderful new anthology, and then to hear also about Amazing Places is terrific. 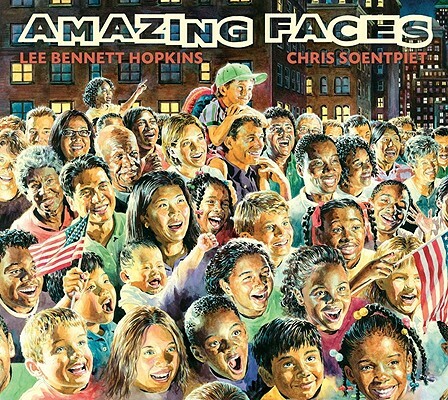 There is much we have to be thankful for in the children's poetry world, and Lee Bennet Hopkins' anthologies and contributions are a huge part of it. 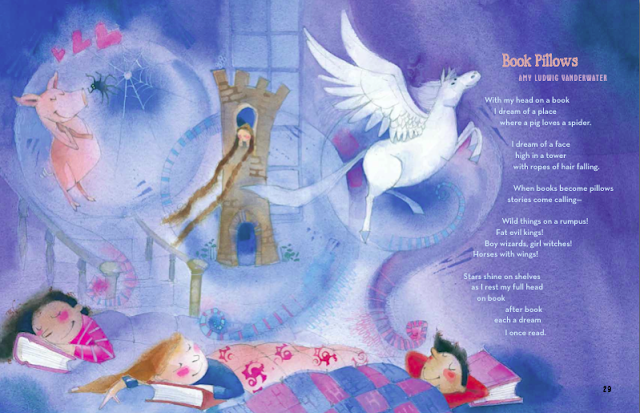 I love the poems shared; Amy's book pillows make dreams something to covet! Looking forward to trying the challenge! Thank you. I have a feeling we're going to be pulling quite a few heartstrings this month with the ME poems. Thanks, as always, for being a part of it, Linda. Thank you so much for this wonderful interview. I think this challenge will inspire many heartfelt and beautiful poems. That's what I'm hoping. I have tissues at the ready. As if anyone had to twist my arm! ;) Thanks for stopping by, BJ. He is SO right in his advice to teachers. Just read, and let the children read, great poems. I learned a little from formal analysis as a child, but I think I would have developed a greater love for poetry had we just enjoyed it (and if I liked it enough to want to write it, it could be taught in grade 11 and 12 or at university). Thanks for a wonderful behind-the-scenes look at a great man, Michelle! Thanks for your thoughtful comment, Teresa. So many of us heeding Langston Hughes words and "holding fast to our dreams"– it's the only way. I've known Lee for yonks' age. We are growing old together, though he's gotten there a bit before me!!! But every time I talk to him or read about him (and what a lovely interview this one is) I learn something more. The man is a virtual Rubik's Cube. Twist him one way and it's all red, another way blue. And oh, the patterns you will find! Thank you once again for an informative interview, Michelle. Mr. Hopkins's books are always well-received in my library. The new one just arrived in a box, I hope no one snags it before I do! Grab that book quick, Diane, or it may be a while until you see it again! I'm looking forward to your contribution to the challenge. :) You'll be happy to know we're done with mandatory rhyme for quite some time. Jumping Off Library Shelves will be jumping ON to the library shelves at my son's school. Gorgeous book! A titan of poetry reveals his humanity in this insightful interview. Thank you! A "titan of poetry" indeed! Thanks for stopping by, Jilanne. This interview is so well done. What a thought inspiring person. How wonderful that he found that one adult who could change his life, resulting in so many more lives being affected for the good! Little changes can certainly go a long way. We need to remember that about each young person we meet. We may be their change. You're so right, Donna. Thank you for your inspiring words in this comment! What a fantabulous interview. Thanks for shining the light, Michelle, and for being a beacon, Lee! Thanks, Buffy. :) My flashlight got a workout. Oh, the stories he can tell, Bridget! I had the pleasure of attending a workshop with Lee not long ago. Could have sat there happily for days listening to his stories. Michelle, this is an outstanding interview with one of the literary luminaries in the field of literacy.I remember the very first time that I sat enthralled in a conference listening to Lee Bennett Hopkins. I not only had him sign my book but had the opportunity to speak with him-a time I shall never forget. I love the ditty challenge. I attended a day-long workshop with Lee last June, Carol. You're right, it's an unforgettable experience! What a wonderful interview. It's great to know there are anthologies being published where newbies can get a start. Thanks for this post. I will be working on a poem for the challenge. Sylvia Vardell's and Janet Wong's Poetry Friday Anthology educational series is also a great place for newbies to get a start. Looking forward to your poem, Rosi! Michelle thank you for such a thoughtful and inspiring interview with Lee Hopkins. I will be hunting for Jumping Off the Library Shelves this weekend. What a great ditty challenge to make Mr Hopkins. I can't wait to see the poems that get posted. Thanks, Maria. I'm not sure you'll find JUMPING... in stores this weekend. The official release date isn't until 9/9, though copies are already being sold on Amazon. Great post, Michelle. 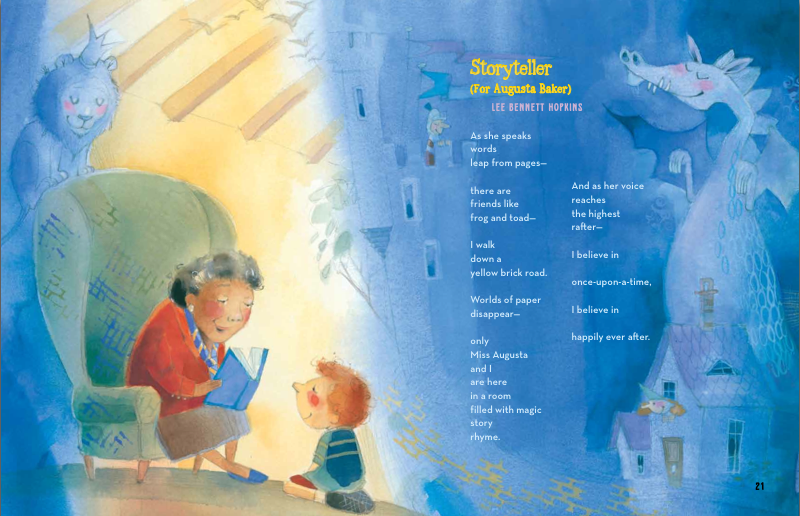 Love Hopkins' poem "Storyteller." So simple yet clever. And this is a fun ditty challenge, Michelle! Isn't that a beautiful poem, Violet? So much love in that one. So much fun once again, Michelle. I always enjoy looking into authors' lives and craft. Thank you for your dedication to poetry and this blog. And I love this month's ditty challenge, Lee! Thanks, Kristi. I am tremendously honored when my featured authors trust me with their words and life stories. What an amazing interview, Michelle! Thanks for all you do! Shining a flashlight at the sun, indeed. But how wonderful that we are all invited to pay tribute to this wonder of the children's poetry world with our own small lights! What a beautiful thought, Mary Lee... each poem, a tea light candle. AGAIN -- I thank all of the above for such heartfelt comments. And to JANE YOLEN -- you are NOT old -- you are 'chronologically gifted'! What an amazing interview, Michelle. I've gotten a glimpse of Lee's love of poetry from the NCTE Spotlight interviews on Renee's blog. These words from Storyteller warm my heart. It will be a great month of ditties! Thank you, Penny. That's what I love about these ditty challenges– each month is so distinctive, yet I love them all! I knew of the icon, and now feel I've almost met the man. Reading this interview with Lee was like sitting down at a restaurant and not wanting to leave because the dialogue at the table next to you was so intriguing. You order refills forever, and lean toward the conversation, and drop your fork to even lean closer...and then they get up to leave and you scramble to follow the two hoping to hear more as they walk down the street. Thank you Lee for sharing yourself, and Michelle for this wonderful eavesdropping opportunity. You sound well-practiced in the art of eavesdropping, Damon! You must be a writer or something. ;) Thanks for the smile. Pointing a flashlight at the sun about sums it up - but what a marvelous interview, Michelle. Lee, you radiate warmth and light - who could count how many young lives you've touched so far? With more to come. Many thanks to you both. You're another one who radiates warmth and light, Robyn. :) Thanks for stopping by. I write this comment with my head still in the interview of the poems and the poet.....I don't want to come out. A lovely, lovely work. Thank you so very much for sharing this treasure today. What an awe inspiring post, thanks for sharing Lee Bennett Hopkins with us! What a great interview--and such gorgeous poems by Lee and Amy. Magic. AN LBH follow-up: Again, thank all of you for your comments. I am still b l u s h i n g ! Just popped by, I've been waiting for this book. Calling my bookstore now. I've loved so many of Lee's anthologies, but it will be hard to top my enthusiasm for last year's Manger, but this one may do it! Jane Manning's illustrations are gorgeous. I am trying to catch myself this month, Michelle. I can't wait to order this one. Lee's anthologies please me and my kidlets so much. I won't rest until I have them all. We have one autographed by the maestro, himself. A rare treasure in our family library. The poems by Lee and Amy are full of loveliness. I long to write like they do. I will take up Lee's challenge. Thank you, Michelle. You have given so much with your Little Ditty blog. Michelle, such an insightful, lovely interview with Lee! Thank you so much! 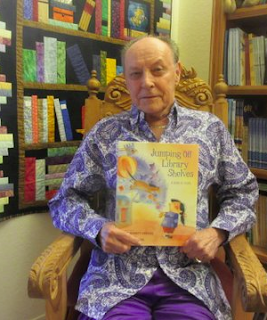 I'M chiming in again ... to thank Michelle for the work she put into my interview and to all the others she has done to enlighten us about children's literature and their creators. I am honored.